Smith & Wesson is going to produce an AR15-type rifle chambered for the .300 Whisper cartridge. This will be an addition to S&W’s Military & Police (M&P) Rifle series. As the first production rifle in the AR platform to be chambered in .300 Whisper (and .300 AAC Blackout), the new rifle offers both sub-sonic and supersonic capabilities. Originally developed and pioneered by J.D. Jones of SSK Industries, the 300 Whisper is based on the .221 Rem Fireball case necked up to .308. Notably, S&W says its M&P15 .300 Whisper is compatible with both the .300 Whisper and the .300 AAC Blackout (BLK) cartridges. The latter is a SAAMI-standardized, trademark-free variant of the .300 Whisper. Manufactured on the M&P15 (AR-clone) platform, S&W’s new semi-automatic .300 Whisper rifle features an 1 in 7.5” twist, 16″ chrome-moly barrel. Both the forged 7075 aluminum upper and lower receivers have been coated with a Realtree APG camo finish. Standard features include forward assist and a six-position, collapsible CAR stock. MSRP for the complete rifle is $1,119. A separate .300 Whisper AR flat-top upper will also be offered, with an $819.00 MSRP. Is Hunting the Real Market for S&W’s .300 Whisper M&P15? Editor’s Comment: If this gun is intended for hunting, we’re not sure Smith & Wesson got this one right. While the .300 Whisper is an interesting cartridge, it was originally designed to run sub-sonic, or be used with a suppressor. At sub-sonic velocities, the cartridge doesn’t pack much punch — not much more than a heavy pistol round. So you’re carrying around an 8-lb rifle (with optics) that only hits like a pistol. On the other hand, it can be loaded up to supersonic velocities, yielding ballistics similar to the .30-30. Now the use of a .300 Whisper with a suppressor is intriguing. But, realistically, how many American hunters are going to get fingerprinted and pay the $200 tax for a suppressor, not to mention the hefty cost of the suppressor itself? As for the rifle configuration, a 16″ barrel is quite short for a hunting gun, and a wobbly first-gen collapsible stock that rattles is the last thing we’d want to take hunting. Share the post "Smith & Wesson Rolls Out .300 Whisper AR-Platform Rifle"
You don’t seem to grasp the mindset of people buying guns like this. All they care about is does the stock collapse, is the barrel short, and how many rounds can the magazine hold? Most people shoot these guns at 50yrds and want to see how fast they can unload the magazine. The same rifle you use for house protection that has quiet ammo,(quieter than .223) 30 round mags and extreme pointability and mobility indoors can double as your woods rifle for whitetail deer. All AR mags work in it from your .223 rifle without modifications. All your gear from mag pouches to cleaning kits are the same. What’s not to love? Obviously you have never shot a suppressed 300 whisper on a AR platform. The round was adopted by the CIA and special forces during Vietnam. With a 240 Sierra loaded at 1100 fps it would shoot sub 1 moa at 200 yards.No boom or sonic crack. They took out a lot of NVA. In a NFA bolt gun the are a killing machine. Killing people is different than killing game. The whisper puts a small hole in and a small hole out. Many shot with the round died before they knew they were shot. High BC bullet give it an effective range of 200 yards. You are mistaken Nat and must be thinking of some experimental ctg (7.62x28mm)because the .300 Whisper wasnt even developed until 1990’s by J.D.Jones. It was only loaded with a 172 grainer and deemed too unreliable in the functioning dept. Not sure if the 240 SMK was even around during vietnam either. The round was never “adopted”. So much for urban legends. Also not sure its legal to hunt with a supressor. I would think that for hunting, people would use the 125 grainers at 2300-2400fps that are comparable to a 7.62x39mm round. I have had no problem killing deer with a Ruger M77 all weather ultra light in 7.62x39mm ctg and with said bullet. I know nothing about J.D. Jones and the 300 Whisper. I know the 300 Whisper was developed in a joint effort by the CIA and Special Forces during the 1960s as a covert operations weapon. There have been several articles about the 300 Whisper in numerous shooting journals (NRA American Rifleman)that document this. I was a Deputy Sheriff in the 1970s and our SWAT team was looking at the whisper as an addition to their firearms. I had a Capt. who had a registered full auto 300 Whisper that was suppressed and that was between 1977 and 1979 that I loaded ammo for. RCBS and others have been makeing form dies for the whisper since the 1960s. Beleive what you may. J.D. Jones is generally crediting with developing the wildcat now known as the .300 Whisper. See: http://www.lasc.us/RangingShotlongWhisper.htm . 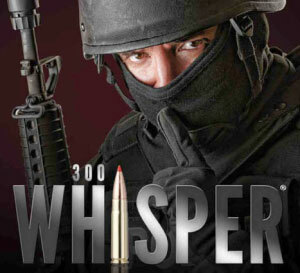 “The 300 Whisper was designed by the indomitable and innovative J.D. Jones, an ex-IHMSA match director and owner of SSK Industries”. 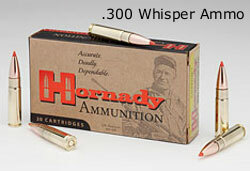 Hornady likewise credits Jones as the father of the .300 Whisper. That said, it’s entirely possible other entities may have worked with a similar cartridge much earlier. In the realm of wildcats, there is rarely a “new” innovation that hasn’t been tried by somebody else before. I was wandering who would follow AAC and the .300 BlkOut. I`m also sure the cost is lower also. From Wiki>> http://en.wikipedia.org/wiki/300_AAC_Blackout_(7.62%C3%9735mm)“Pioneering work by the USAF Armament Lab at Eglin Air Force Base in the late 1960s produced the 7.62×28 cartridge which propelled a 172gr match projectile to the 1,050 ft/s (320 m/s) range but suffered from various reliability issues””More recently, popular wildcats such the 300-221, 300 Fireball, and JD Jones’ proprietary version of them, the .300 Whisper, have furthered the concept.” I rest my case. Not to be a dooms-dayer, but a suppressed AR with 30 rd clip would be good at tagging zombies. Most encounters (theoretically) would be within 200 yards so no worries there. Even with bullistics that are close to a 45, it catches my attention. Last i heard, the 45 is still really effective at stopping bad guys, I mean zombies. So until we get our laser blasters, I’m serously considering this one. Ammo availability will be a problem, so better have a backup, as most zombies won’t have this one on them. just bought mine today. i purchased it for my grandsons to be able to shoot whitetaliled deer. i have read up on it and feel very satisfied that it will do just fine for hunting. a true hunter stalks his prey and gets as close as possible. i believe in teaching my boys the art of stalking and shot placement instead of trying to be a long range shooter. with the minor recoil i believe that my 4 and 5yr old grandsons will have no problem taking thier 1st deer this season. I just got my M&P 15 .300 Whisper. I’m trying to decide on some good optics without breaking the bank. I’m in the Army and have a budget of about $250 – $300. Does anyone have a good scope they would recommend?